I'm pretty jazzed about this outfit. My inspiration for the dress was a skirt Karen had made. 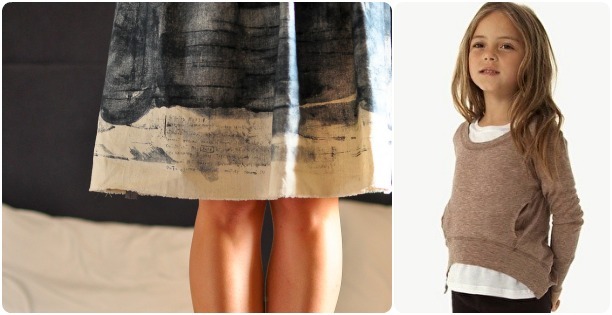 Without sacrificing the graphics of the fabric, she used the selvedge edge as the hem of her skirt. For the top, I actually saw this picture(above) on the KCWC Community Board on Pinterest a while back. If there was one in my size, I'd sooo have it. 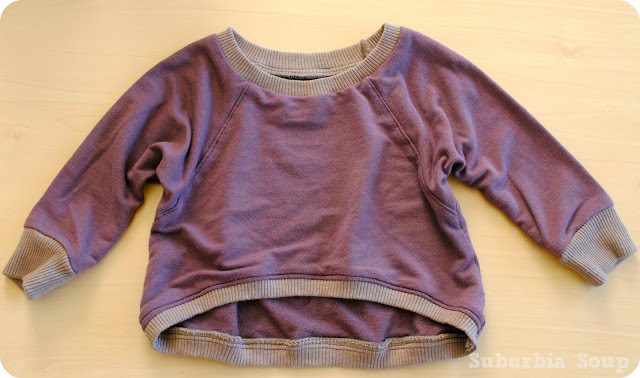 For the top, I altered my raglan tee pattern that I made from Jess' Raglan Tee Tutorial. The main fabric is organic french terry knit. Okay... can I just tell you how delicious this fabric is? It's sooo soft, like you've had it for years. My only gripe is I wish I bought more. Fall here is a mix bag. One day it can be cold, the next hot, wet then dry... you get the picture. So it's always wise to dress in layers. Today is Lala's special day... she turns 2 today. Great post- and guess what? That picture of that top on the little girl... you mentioned it came in your size you would get it. It's from All Saints. I have that light sweater top in an oatmeal colour. All Saints used to do a kids range with the adult stuff in smaller sizes. They stopped it, but the adult stuff is still on the go and very beautiful. As soon as I can get my hands on some more organic french terry knit, I'll be making more! She looks gorgeous! I love the whole look. I have a huge crush on sweatshirts and this one is to die for! Thanks for linking up! All of these are so sweet! I love that sweatshirt, and totally wished that 1. it came in my size, and 2. it was cool enough to need one here!!! Wonderful outfit - comfy and stylish, the only way to go!! Comfy AND stylish... the best combo! 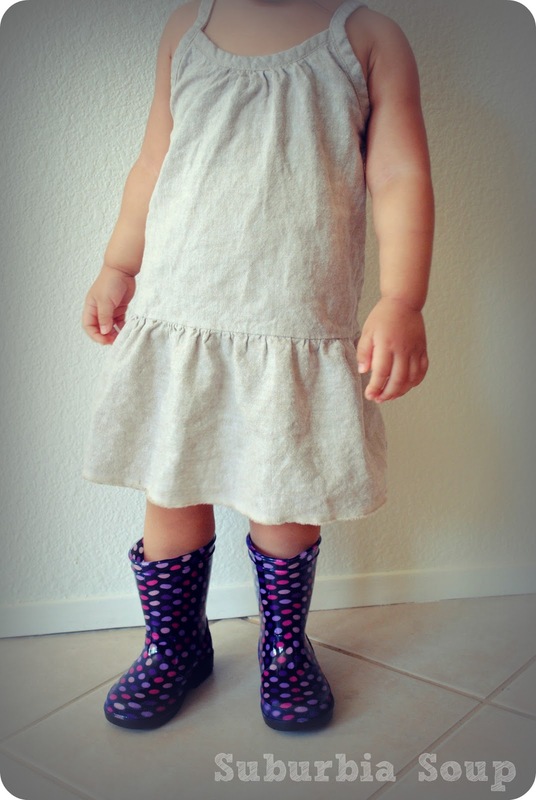 Oh my goodness, Lala could NOT be anymore adorable and neither could her outfit. I can't believe you made it. You are seriously amazing! Thank you Morgan!!! We're honored! 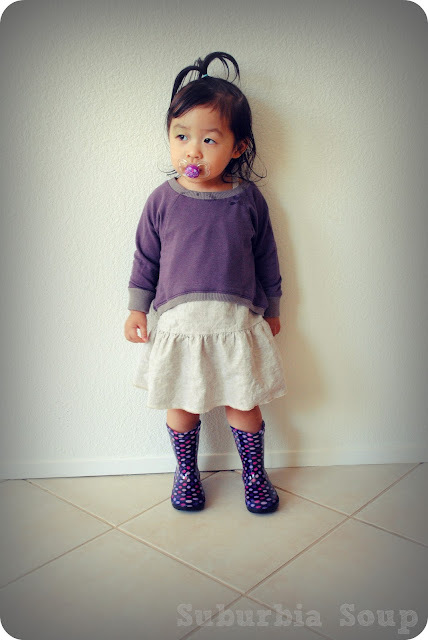 Congrats on being this week's featured small styler! Your little one is too cute!! Can't believe you made that outfit. You're so creative. Thank you Susan! Oh my goodness... how funny is that you have three kids around the same age?! Fun?!? Well... it certainly keeps you young, ay??? Absolutely love this outfit!! Just came over from your Belgian Style Post on Straight Grain :) I think I'm going to have to make one of these cute tops for my little!